Much like the rest of the post-war American automotive industry, Plymouth essentially began selling warmed-over versions of their 1942 lineup. In order to get back on the market as quickly as possible, the P-15 model carried only minimal exterior changes from the previous model, namely in the grille, and it continued to be offered in both DeLuxe and Special DeLuxe trims. The DeLuxe was limited to three- and six-passenger coupes as well as a two-door sedan, while the Special also featured a four-door sedan, and convertible, and a wood-clad station wagon. The station wagon featured removable second and third row seating making for a cavernous hold when so configured. Plymouth continued its well-earned reputation as reliable and affordable family transport, and the 1946 model’s biggest strength was its affordability. A new buyer could get behind the wheel for between $1,150 and $1,626. DeLuxes were very basic, and Specials added more brightwork, rear bumper guards, rear window vents, dual windshield wipers, a locking glovebox, and sun visors. Given that the difference between the two trims was typically less than $100 and that the Special had many more body choices, 1946 Plymouth Specials outsold DeLuxes three to one. In all, approximately 260,000 Plymouths were sold their first year back on the market. 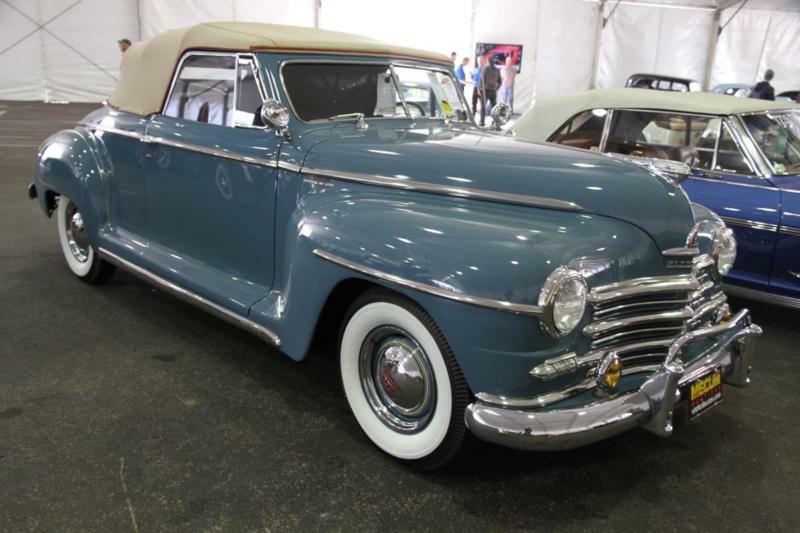 The 1947 and 1948 models continued with minimal change as Plymouth focused on their first all-new designs since 1942, which would debut in March of 1949. Some P-15s were sold as 1949 models from January until March when the new DeLuxes debuted. A four-door sedan was added to the base DeLuxe line in 1947 and 1948 saw the use of smaller wheels and tires. Change was less important than price for consumers during this time, however, as Plymouth was the third best-selling nameplate from 1946 through 1948, behind Chevrolet and Ford. They sold more than one million models during these years. Today, Plymouth P-15s offer plenty of attention for the dollar. Their 95-hp, 218-cid L-head six-cylinder engine is not a screamer, but it is dead simple to work on. The cars are not luxurious, but they are unmistakably of the era and stand out in nearly any venue. The immediate post-war cars are also overlooked in favor of later post-war designs, so they remain reasonably priced as a general rule, especially when compared to similar vehicles from Ford and Chevrolet. The woody wagon is a notable exception. Those who look beyond brand loyalty are likely to find a relative bargain.